SSC CGL Exam is the most recognized exam among the Indian graduates because it offers many lucrative jobs. The nature of graduation degree possessed by the candidates does not matter in the exam. Hence, many graduate candidates of all the streams appear for the exam that makes the competition very tough. The Tier 1 Phase of SSC CGL Exam has successfully conducted.After clearing the Tier 1 Exam, candidates look to the effective SSC CGL Tier 2 Preparation Strategy. The strategy will be completely different from that of Tier 1 Paper. However, your Tier 1 preparation can construct a base for Tier 2 preparation. As the result of the Tier 1 Exam has released on 31st October 2017. The syllabus for the Tier 2 paper has Quantitative Aptitude and English language, which were also there in the Tier 1 paper. In SSC CGL Tier 2, speed plays the most important role, because the number of questions is more, which should be solved in lesser time. Along with speed, you need to focus on accuracy also. Without accuracy, you can’t score qualifying marks. Target SSC CGL 2018 Exam! Take help of Theory Content, Mock Test Papers & Shortcut Mantas PDF designed by Eduncle Experts! Download for Free! Aspirants! 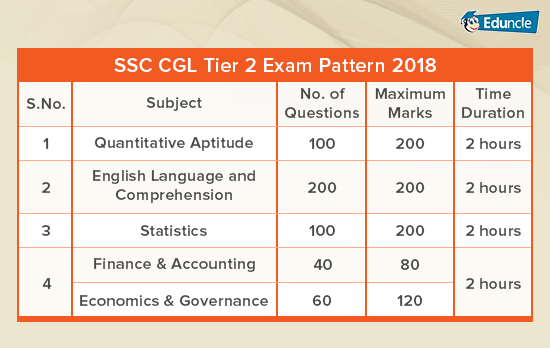 Now after having the basic idea about the Tier 2 Exam, let’s move on to understand the paper pattern of the SSC CGL Tier 2. Please give a concentrated look on Exam Pattern for Tier 2 phase as shown in the image given below before you start gathering the SSC CGL Tier 2 Preparation Material. Paper 1 & 2 are compulsory for all the aspirants. Paper 3 is only for all those aspirants who have applied for the post of Statistical Investigator. Negative Marking: The negative marking for the Paper 1, 3 & 4 is 0.50 marks and for Paper 2, it is 0.25 marks. Only knowing the syllabus and pattern is not enough to clear Tier 2 Exam, you should have a copy of SSC CGL Tier 2 Syllabus 2018. After the completion of Tier 1 Exam, many aspirants can have queries about the SSC CGL Tier 2 Preparation Plan and questions regarding the preparation tips for SSC CGL Tier 2. But without certain guidance sometimes the plan fails. To help you score good and attain qualifying marks in the exam, we are providing you some directions and essential SSC CGL Tier 2 Preparation Tips, which you need to keep in mind while making study plans. First and foremost, the important thing that you need to keep in mind before starting SSC CGL Tier 2 preparation 2018 is its syllabus and paper pattern. This will give you an insight about the exam and help you in making the further strategy. If you are aware of the syllabus, it will be quite beneficial, as you can focus on the important topics and prepare accordingly. After the syllabus, here comes another important task to analyze your weak and strong topics and make a perfect SSC CGL Tier 2 preparation plan according to that. Give more time to the weak topics. The preparation plan will give an edge over your preparation. You can prepare the timetable according to your comfort. Try to give mock papers based on latest SSC CGL Exam Pattern in one go. Analyze the time you take to solve the questions and the average time you dedicate to each question. Be aware of the concept of negative marking and practice according to it. If you minimize your negative marking, it will be quite beneficial for you. For the last minute revision, you must prepare a handbook or notes on your own. It should contain all the important formulas and vocabulary words which will help you at the time of the revision. Remember! You should write only the important things in this book that will help you in memorizing the topics. Don’t write unnecessary stuff. In SSC CGL Tier 2 Paper, find and solve easy questions first. This will give you a self-confidence. It would be beneficial if you solve the paper in different cycles. In the first cycle, you can solve easy questions and in the subsequent cycle, you can move from easier to tougher ones. Practicing regular mocks give you a feedback of your SSC CGL Tier 2 preparation strategy and you can check & boost your speed by minimizing the time used to solve the questions. Try to attempt mock tests of different difficulty levels and keep practicing them until you get success! This way you can achieve command over your weak areas. Try to practice SSC CGL Previous Year Question Papers which will help you get the actual feel of the exam. We will help you with the section wise SSC CGL Tier 2 exam preparation strategy and plan with some useful ideas about the preparation. Also, you can note the most Important Topics for SSC CGL Tier 2. Click to Download !! SSC CGL Study Material for better preparation and add more scores to your result!! Learn tables up to 25, so that your calculation speed can be increased. Practice all types of questions. While practicing, use short tricks to solve the questions. How to Prepare for SSC CGL Tier 2 English? Make reading a daily routine as 40-50 marks will totally depend on reading skills. Read English newspaper and magazines for about 2-3 hours daily. Apart from reading, solve as many mocks as you can. This subject is only for those who have applied for the post of Statistical Investigator. Start preparing with books of 10th,11th and 12th standards. 1. Finance and accounts2. Economics and governance. How to prepare SSC CGL Exam from scratch? Know the comprehensive SSC CGL Exam Preparation Strategy! Here in this blog, we are handing you over the topic wise study schedule for 30 days to help you in making your SSC CGL Tier 2 preparation strategy. You can follow the schedule and easily crack the exam. Note: - In the above study plan you can give 2 hours to each subject. If there is a need for extra timing for any subject, you can manage your timetable according to it. You can follow the above study plan day by day to study each topic and boost your performance. If you have any queries regarding SSC CGL Tier 2 preparation, you can comment below. In case, you have some more points that could help the other fellow aspirants in preparing for the exam, please add them as well in your comments. Eduncle always welcomes your suggestions. Also, we have plenty more daily tips and tricks that could help you in SSC CGL 2018 Exam. To avail them, you can join us via our Facebook Page and YouTube Channel. Prepare the Best with Positive Actions and You Will Reach the Goal!